Low-fat, yet fabulously delicious. 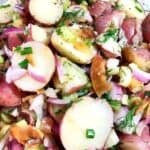 If you are looking for a way to enjoy German Potato Salad without the guilt, give this recipe a try. In a large pot, cover potatoes with water and boil fro approximately 35 minutes (this varies due to size of potatoes, so check for tenderness with fork.